Congress has asked chief minister Shivraj Singh Chouhan that he protested when petrol cost Rs 60 during UPA regime and rode cycle to his office, but will he do it again when petrol prices are nearing 80 per litre in the state. The party has said that Chief miniser used to target Congress government during UPA II but now there is no protest when his party is at the helm though petrol prices are touching sky despite fall in crude oil prices. Leader of opposition in state assembly Ajay Singh has said why the chief minister who cycled to his office when the petrol price hit Rs 60 a litre during Congres rule is keeping mum oday when the petroleum prices are increasing by the day. MP Congress chief Arun Yadav has also asked Shivraj that where are the bicycles that were purchased for a day to protest over modest hike in petrol prices during Congress rule. 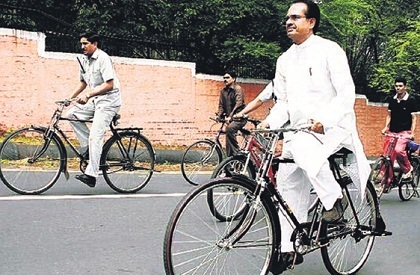 He too asked when again would Chouhan go to office again on bicycle as the petrol prices have reached historic high. Ajay Singh said that Chouhan should tell the people of state that what he would do now as the petrol prices have historically raised to Rs 80 per litre. The people of the state and country are suffering due to massive rise in diesel and petrol prices and the chief minister and leaders of the BJP who used to protest over modest price rise in petroleum prices are today silent over huge price rise, just because there is BJP government at the centre, he added. Yadav said why the advocates of good days are silent over the ‘political loot’ of Rs 30-40 per litre in petroleum products. Besides, the chief minister should tell the people of state that where are bicycles purchased during UPA regime to protest petroleum prices hike. The current hike in petroleum prices is oppression over the people of country as contrary to UPA rule the petroleum prices in international are less than half, he added.